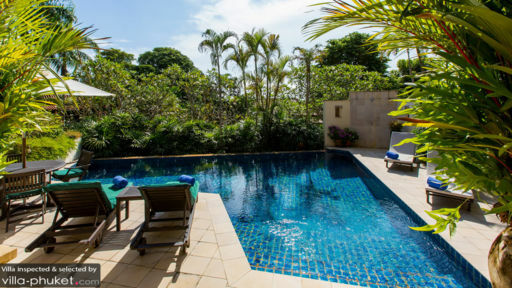 Villa Katamanda Hah is a three-storey vacation residence that embodies the aesthetic blend of distinctive Thai architecture with elegant, contemporary, Asian design. Interiors are appointed with mostly finely finished wood furnishings accompanied by modern, comfortable pieces. Amenities are deliberately first rate – to assure each and every guest’s absolute convenience as well as enjoyment. Atop a hill above Kata Noi Beach, Villa Katamanda Hah truly accords you highland living with an air of gentility. The villa has three bedrooms. Two of these bedrooms are on the third floor. These bedrooms open out to a spacious and furnished balcony with breathtaking views of the Andaman Sea. Another bedroom is on the ground floor with direct access to the swimming pool. All bedrooms have dedicated bathrooms with bathtubs and rain showers. 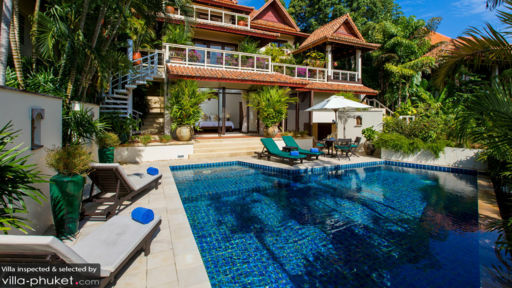 Bordered by tropical foliage – parallel to the villa – is the rectangular swimming pool. Dip into its alluring, crystal clear waters for some aimless wading, or for some playful splashing. If you wish to bathe, instead, in the sun, laze on cushioned pool beds on the property’s exterior stone deck. But as soon as the rays begin to burn, retreat to the shade of the round table with a built-in umbrella and cool off with a fruity drink. On the villa’s airy second floor is the living area with its pair of hefty and easy couches. Here, you can all assemble for some amusing and animated sharing and storytelling. The villa has two dining areas. The indoor dining area – with its wooden table for eight – is adjacent to the living area. The scenic, alfresco dining area is arranged at the semi-open sala at one corner of the second floor’s spacious balcony. At any of these dining areas, you can all feast on appetizing signature dishes which you all, one after the other, concocted at the fully-equipped, ultra-modern kitchen alongside the indoor dinner table. Attending to the villa’s services is a staff headed by a manager backed by a housekeeper and a gardener. Bike and car rentals are available. Villa Katamanda Hah is based in Kata Village. Walking distance from the villa are the white sand beaches of Kata and Kata Noi – the most popular destinations in Phuket especially for families because of their picture-perfect seascapes. Kata Beach is divided into Kata Center, Kata South and Kata Back Road. Highly-recommended dining places at Kata South are Capannina, Boathouse and Villa Royale. Aside from swimming and surfing, more water fun is also in store at the man-made Surf House Phuket. Immense enjoyment also awaits you at the Dino Theme Park with its mini golf course amidst a pre-historic setting. For some sightseeing, head to the panoramic Karon View Point and to the Kata Temple. After dark, see the night come to life at Kata Center. A wonderful home. Much better than we expected. Spacious and well cared for. Equipped with everything you could possibly want. Amazing location near everything we were interested in. We can’t wait to go back! Very nice and spacious villa in a very quiet and luxurious private residence. 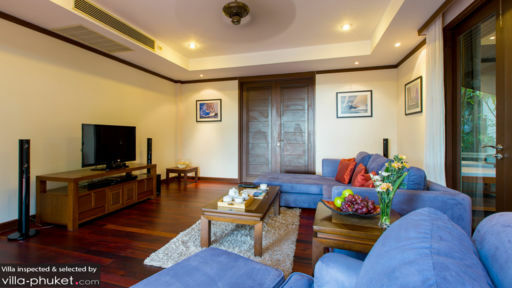 From the living room and the 2 master bedrooms, we could enjoy great views on Kata beach. A nice swimming pool and a comfortable massage room complete the very well equipped house. Tu, the person in charge of the house, welcomed us and catered for all our needs. Our stay at the villa was perfect.